It’s not like I can hear him over this medium. 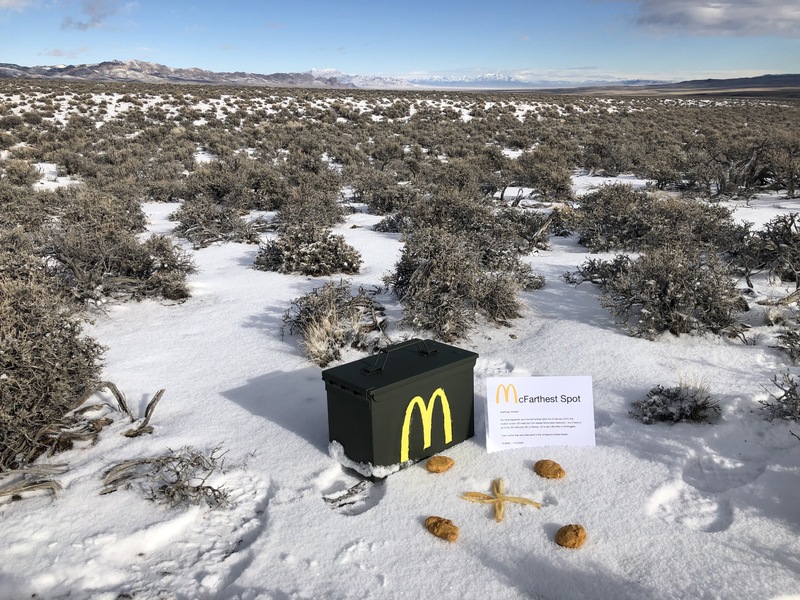 McFarthest spot - the point in the contiguous United States that is furthest away from any McDonald’s restaurant. I woke up groggy on a motel floor and checked my phone. 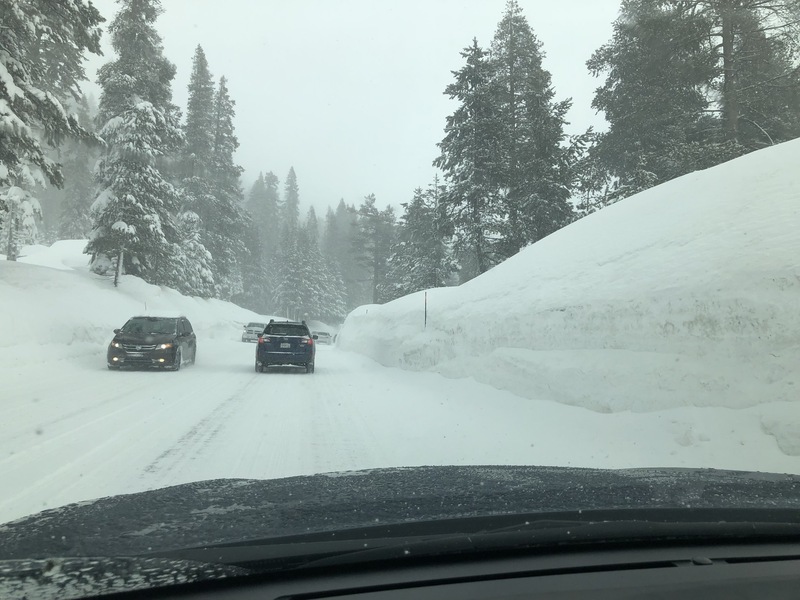 A road trip through the Nevada desert during the biggest snow storm in recent memory was starting to seem like a really, really stupid idea. 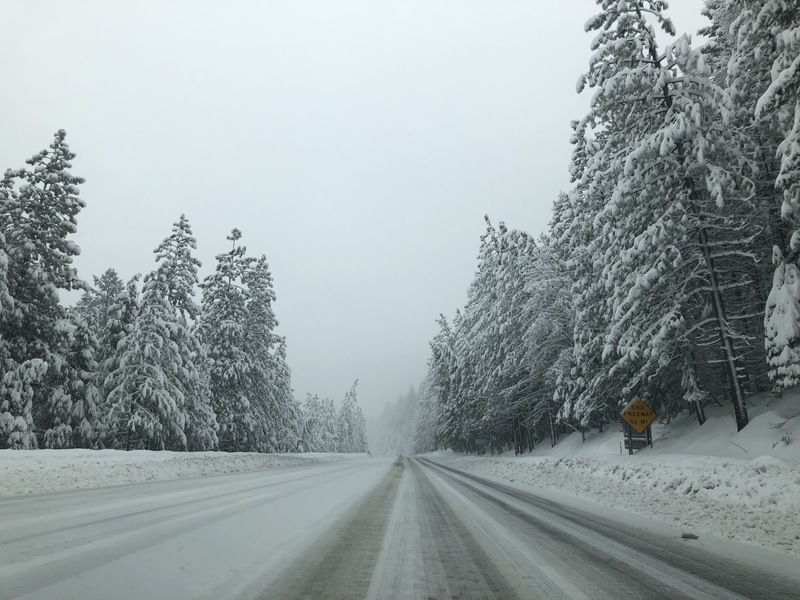 I’d spent the previous day driving over the Sierra Nevada mountains with my dad and a longtime family friend who I call Uncle Randy. 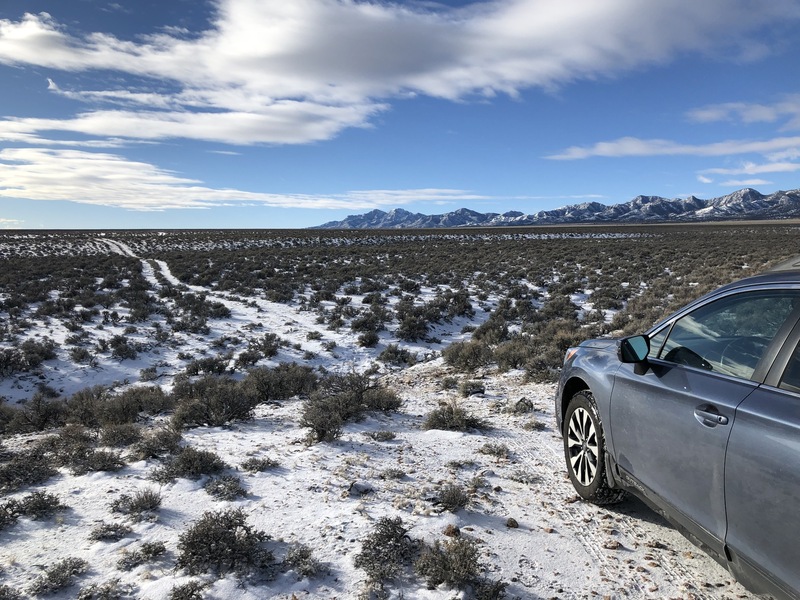 It took several hours of stop and go traffic and some deft navigation of snowy mountain passes, but we had made it to the quiet little town of Tonopah, Nevada. 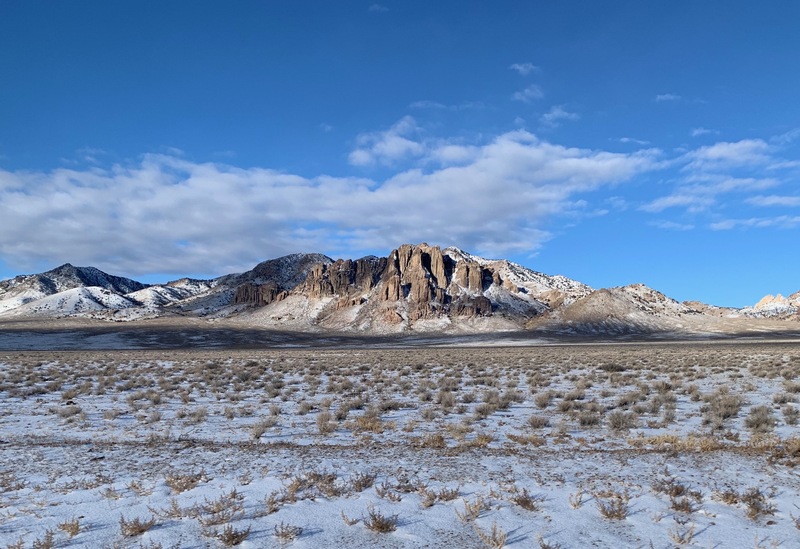 The Spot now lies on some BLM land in the middle of Nevada, just northwest of Groom Lake - better known as Area 51. It’s just over 120 miles as the crow flies to the nearest Big Mac, even more if you account for driving miles. It seems to me oddly far, but also strikingly close given the magnitude of the 3.1 million square miles we in the US have between Canada and Mexico. And it was our goal for the morning. 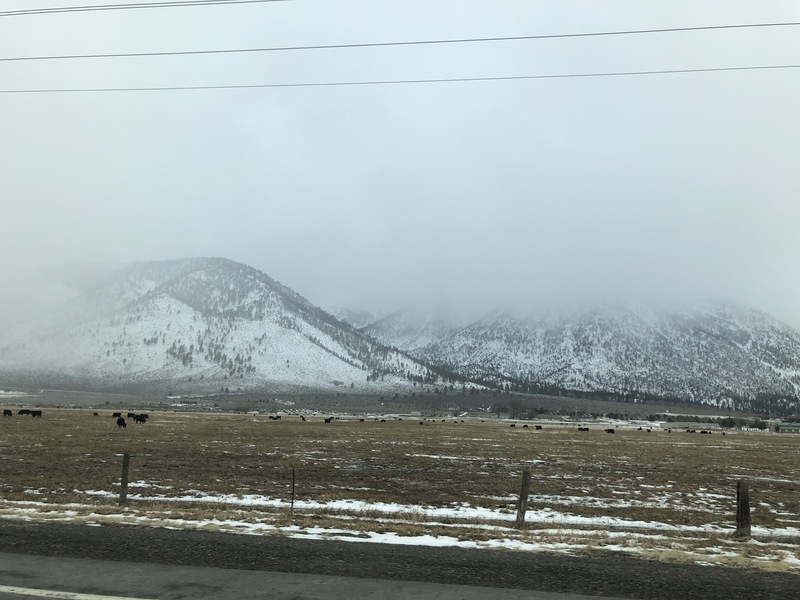 We were on a Nevadan road trip for whatever reason, and the McFarthest Spot was next up to check off the list of sights to see. We all piled into the car and got an early start east out of Tonopah, towards the Spot. The evening before we actually stopped at a McDonald’s where I picked up some fries and nuggets, and stashed them away to enjoy later. I was also in the mood for a shake but the machine was broken (natch). Early morning in Tonopah had the weather trying hard to break into the twenties when we set off in my dear mum’s Subaru. I was behind the wheel, and was thankful I had downloaded all the necessary map tiles needed to find the Spot as we bid the town adieu. Cell reception dropped to 3g, 1g and then disappeared altogether. 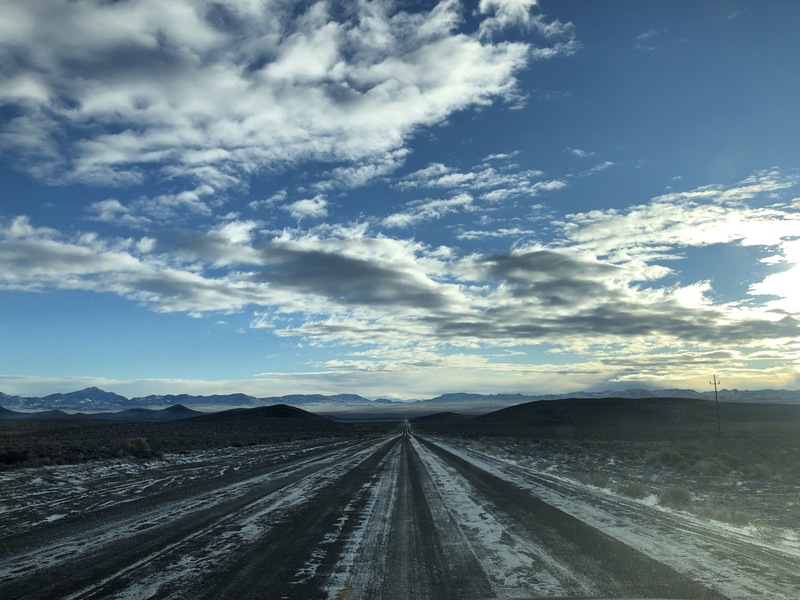 The open road of US-6 was stunning as we descended toward Warm Springs and the junction with NV-375, better known as the Extraterrestrial Highway. We were close. Just a mile on to 375 we slowed to a crawl and I spotted the dirt road we’d be taking for the next twenty or so miles of the journey. My dad, still incredulous as to what we were actually doing, confirmed with me that yes this was the right way and yes we are going to the middle of nowhere. I double checked the coordinates on my phone again, just to make sure. We were headed due south on an unnamed dirt road, making fresh tracks in a light dusting of snow. The mountains to the west of us were gorgeous, looming in the distance and gleaming in the morning sun. The road deteriorated a bit, and I slowed down a couple miles out from the waypoint. I had done my homework and studied the satellite images of the area and dropped pins at various waypoints along the route. Different intersections, possible paths through the brush, where tracks seemed to pick up and then disappear again, they all got a marker on my digital map. We reached an intersection where we turned east from the dirt road to a set of lonely tire tracks. Sagebrush scraped at the undercarriage of the Outback, and I made a mental note not to forget to wish my mum a happy Mother’s Day this year. After a few hundred feet, we turned on to an impossibly smaller track that revealed itself and disappeared at various points along the way. We pushed on until we hit a snag - a dry creek bed that crossed directly through the road, such as it was. I sent my dad out to spot but the obstacle proved too extreme for our valiant steed, so we had to park it and walk from here. We were a mile out. The temperature had just broken 20 Fahrenheit. I threw some gear and extra water in my bag and we all headed out in the general direction of the Spot. 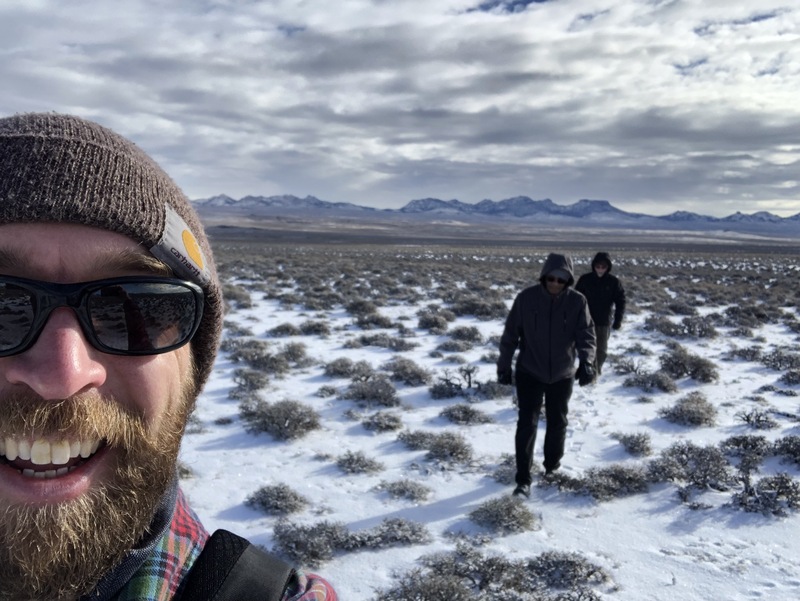 Living in Colorado, I’m used to the occasional jaunt up and down a 14er and am quite happy in thin mountain air, but my dad and Uncle Randy were not as accustomed. They were troupers, though, and we all made our way south down the road as the sun meandered in and out of the clouds. Checking my phone, I decided it was time. We had to leave the tire tracks we were following and hoof it overland to the Exact Spot a quarter mile or so from the tracks. I kept my phone out now, following the arrow that was leading us to the McFarthest Spot and showing our distance. As the numbers counted down - a quarter mile, a thousand feet, two hundred feet, 50 feet - I stopped. The actual point furthest from the golden arches, we had made it. Not knowing what else to do given the highly anticlimactic nature of reaching our goal, we shared high fives then I unpacked my bag. I had to have some fries. The car had acted as a decent fridge overnight in the single digit temperatures, keeping the previous day’s spoils relatively intact. I grabbed some fries out of the bag and had my second breakfast. 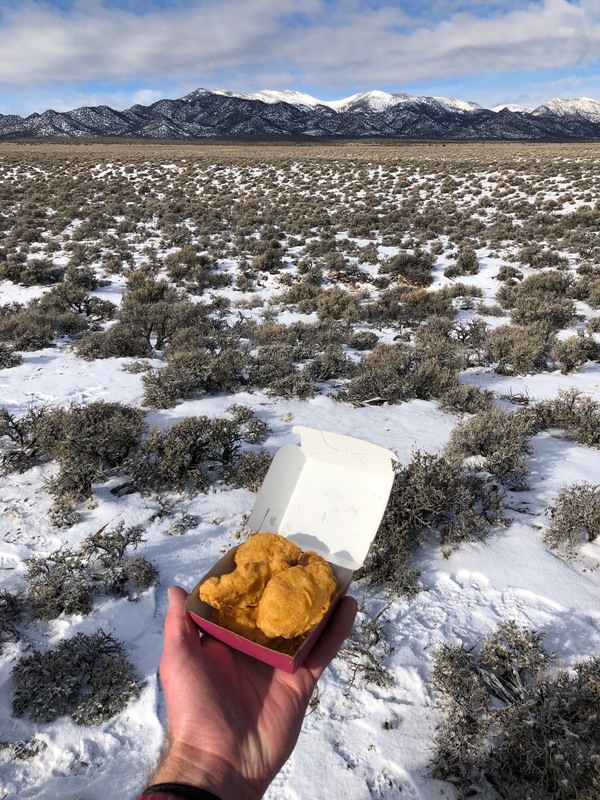 The chicken nuggets were surprisingly edible if I just closed my eyes and appreciated the location we were at more than the processed meat I was eating. We all took our requisite selfies and I prepared the geocache. Of course we were going to leave evidence of our trip! I was bumped to an earlier flight to California for the trip, so I had some time to spare before we left. 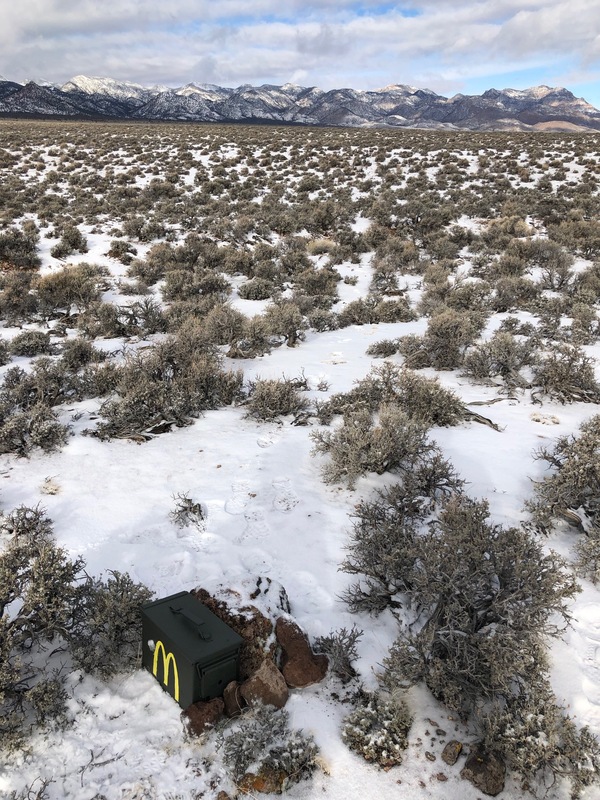 With a quick trip to a big box store I had an ammo box, a pad of paper with a pencil for a register, and some leftover McD’s stuff to commemorate the location for future visitors. After soaking in the view one last time, we packed up and started the mile-long journey back to the Subaru. 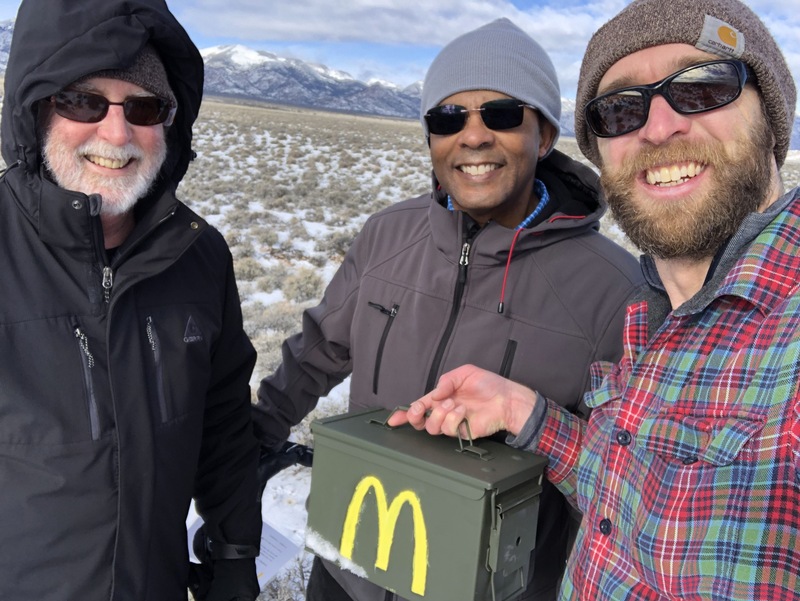 Our steps were lighter, and conversation flowed a bit easier as the sun hit our backs and each step we took was one step closer to a McDonald’s, no matter the direction. We were on to other adventures. 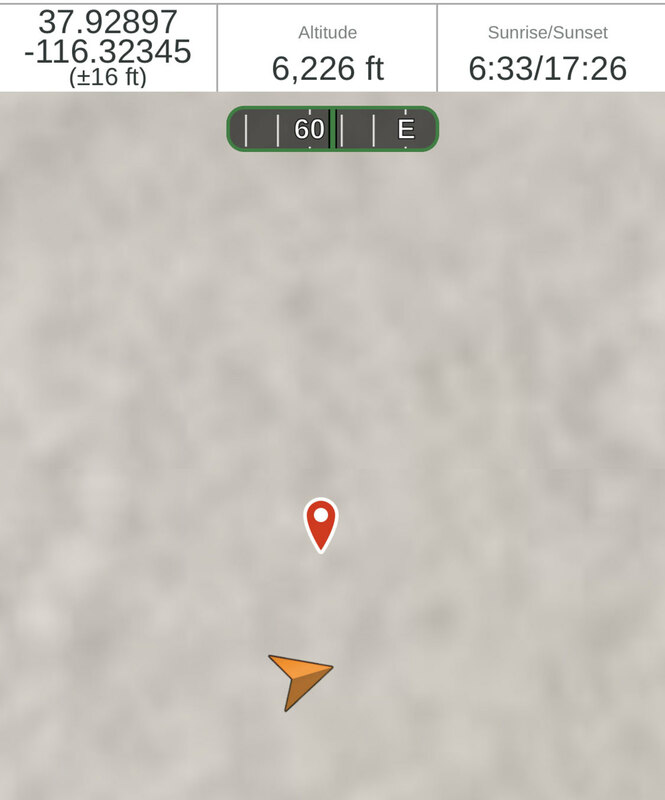 A million thanks to Stephen Von Worley and his original McFarthest Spot post, which I found while doing some GIS work. When the updated post came out that coincided with a road trip we were planning in the area, it was all over but the shouting. If you wish to visit the McFarthest Spot, I encourage you to do so. Please sign the register and leave something from your own last supper if you do. Based on this post I bought a QP last night to specifically put sriracha on it. Liked it so much I put it on the cheeseburger I bought as well. 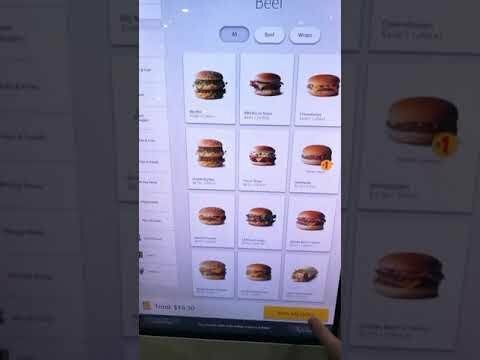 The McDonald's AI will optimize menus based on factors such as weather, the time of day, local events and how busy the restaurant is. 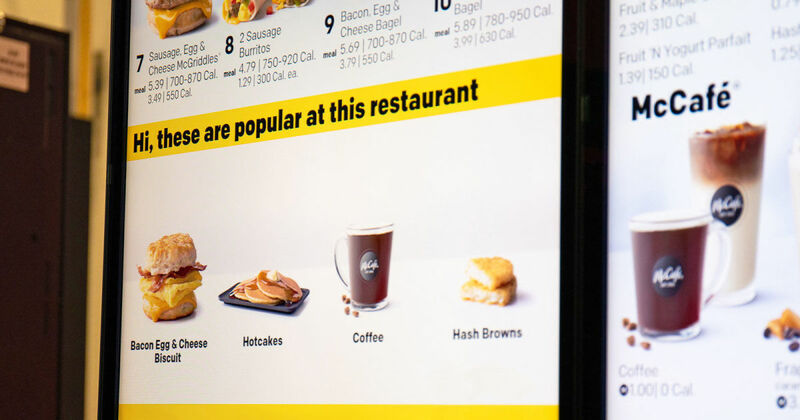 McDonald’s tested the AI at several restaurants last year, and executive vice president and global chief information officer Daniel Henry told Wired he expects more than 1,000 locations will be using it within the next three months. The system will ultimately reach all 14,000 US restaurants and expand to other markets. McDonald’s also plans to add the AI to self-order kiosks and its mobile app, and perhaps other parts of its business, such as kitchens. Dynamic Yield will still operate as an independent company. Its current clients include Ikea, Sephora and Urban Outfitters. The potential applications at its new parent company are particularly intriguing, however. For instance, Henry said the company may eventually use license plate recognition as part of the system. That way, the AI could identify your car and tailor the menu specifically according to your purchase history. Thinking of having a crack at a Chicken McFeast for Lunch. What’s the rub? Any good? There can never be too many Grimace related characters. I’d buy a McGrimace. No matter what it was. I’m assuming they’re not too popular then?? It’s a hamburger with lettuce and sauce. Except with chicken instead of hamburger. Stop being stingy with the gravy. 1 You can get gravy from McDonald’s? 2 Why would you get gravy from McDonald’s? 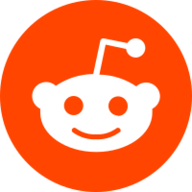 Edit: Sorry. 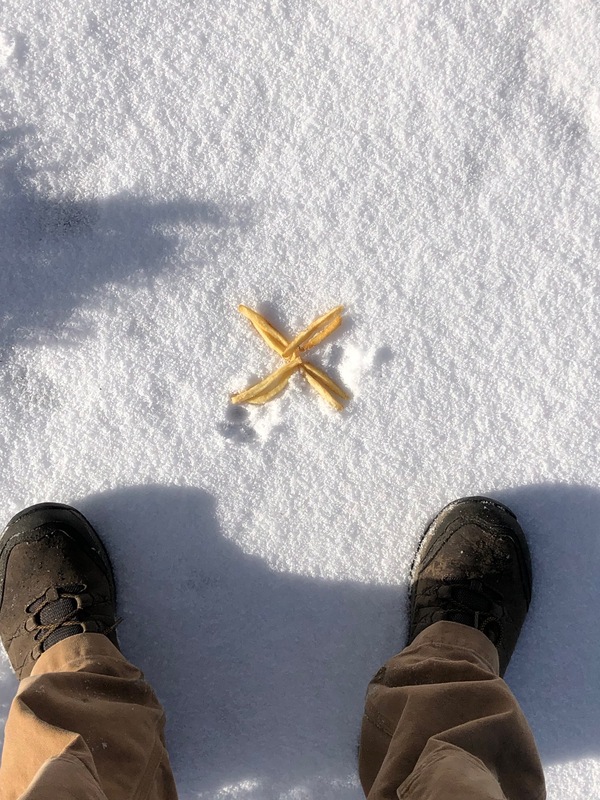 Fries. I know they’re touchy about that. I suggest the ad people learn to count, or add up. That new ad where the female geriatric is demanding $6 from an IOU when they were 16. Decimal currency came in in Feb 1966 and if those two are 69 or younger, they’ve had a damn hard trot in life. 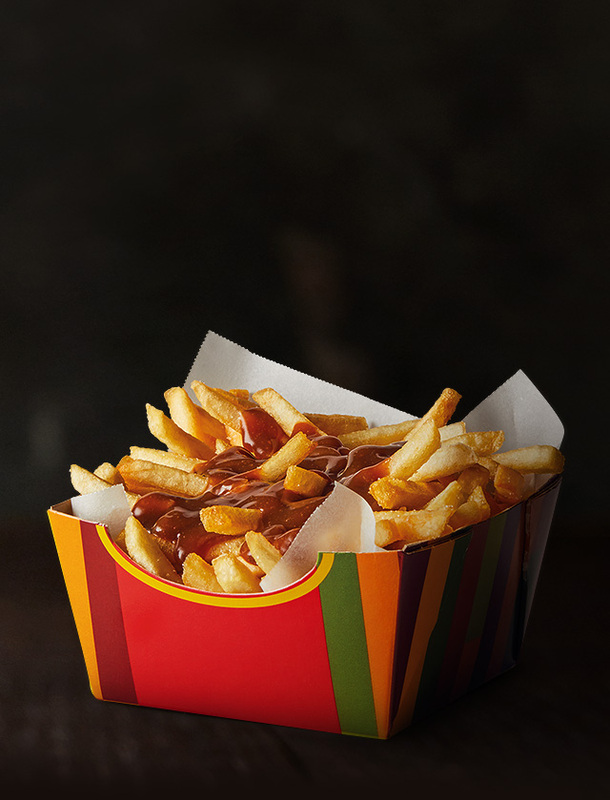 Not to mention that $6 back in 1966 would probably buy the entire Maccas menu…for both of them.